The new WW is Weight Watchers Reimagined! WW is a global wellness company focused on improving overall health. Founded as a weight-management program in the 1960s, they have since expanded their expertise beyond weight loss methods, achieving a holistic approach to wellness that encompasses not only healthy eating but also physical activity and a positive mindset through a livable and flexible program designed to build lifetime healthy habits. 2 Days Only! Save 55% on 3 months of WW Digital. Restr. Apply. The New WW is Weight Watchers Reimagined. Get Free Joining + Free healthier when you lose 10 Lbs With select WW plans. Restrictions apply. 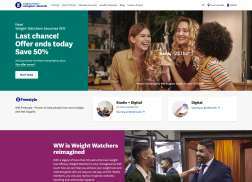 Offer Extended: Get Free Joining (Ends on 2/25/19) + Refund of 2 months When you Lose at least 10 lbs within your first 2 months (Ends on 12/29/18) With select WW plans. Restrictions apply. 2 Days Only! Save 55% on 3 months of WW Digital+Studio. Participating Locations Only, Restr. Apply. The New WW is Weight Watchers Reimagined. Get personalized support every step of the way with Personal Coaching (includes OnlinePlus). Get refund of 2 months’ worth of applicable fees with select WW plans when you lose 10 Lbs within your first 2 months + Join for Free. Restrictions apply. Get a free Year-Round Fresh cookbook with purchase of select subscription plans. One cookbook per member.